Pourabdollah, K., Latifi, A., Golzar, H., Garshasbi, M. (2016). Numerical Analysis of Temperature-Sensitive Hydrogels for Controlled Drug Release. 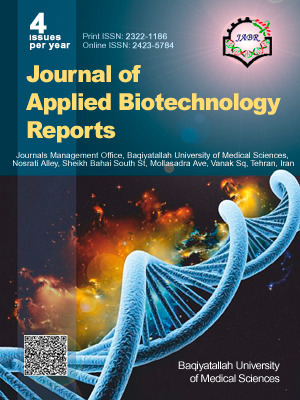 Journal of Applied Biotechnology Reports, 3(1), 365-372. Kiana Pourabdollah; Ali Mohammad Latifi; Hossein Golzar; Morteza Garshasbi. "Numerical Analysis of Temperature-Sensitive Hydrogels for Controlled Drug Release". Journal of Applied Biotechnology Reports, 3, 1, 2016, 365-372. Pourabdollah, K., Latifi, A., Golzar, H., Garshasbi, M. (2016). 'Numerical Analysis of Temperature-Sensitive Hydrogels for Controlled Drug Release', Journal of Applied Biotechnology Reports, 3(1), pp. 365-372. Pourabdollah, K., Latifi, A., Golzar, H., Garshasbi, M. Numerical Analysis of Temperature-Sensitive Hydrogels for Controlled Drug Release. Journal of Applied Biotechnology Reports, 2016; 3(1): 365-372. Today hydrogels are considered as the materials that are able to play important role in drug delivery systems. To design an effective hydrogel applicable network, mathematical modeling has a critical role. A successful drug delivery device relies not only on intelligent network design but also on accurate prior mathematical modeling of drug release profiles. In this study, the modeling of the inflation behavior of temperature-sensitive hydrogel has been done by providing a mathematical model according to the thermodynamics and kinetics of the temperature-sensitive gel and also considering the heat transfer into the hydrogels during the inflation. The proposed model has been investigated numerically. The comparison between numerical and experimental results shows perfectly success in integrating equations of inflation thermodynamics and kinetics for modeling the inflation behavior of temperature-sensitive hydrogels that provide a new step in the modeling of such systems. Huglin, M.R., Hydrogels in medicine and pharmacy, CRC Press, Florida 1989. Sato Matsuo, E., Tanaka, T., Kinetics of discontinuous volume–phase transition of gels. J Chem Phys. 1988, Vol. 89, pp. 1695-1699. Fan, L., Singh, S.K., Controlled Release: A Quantitative Treatment, Springer Science & Business Media, 2012. Hoffman, A.S., Hydrogels for biomedical applications. Adv Drug Deliv Rev. 2012, Vol. 64, pp. 18–23. Gehrke, S., Synthesis, equilibrium swelling, kinetics, permeability and applications of environmentally responsive gels, in: Responsive Gels: Volume Transitions II, Springer Berlin Heidelberg, 1993, pp. 81–44. Yoshida, R., Kaneko, Y., Sakai, K., Okano, T., et al., Positive thermosensitive pulsatile drug release using negative thermosensitive hydrogels. J Control Release 1994, Vol. 32, pp. 97–102. Van Dijk, M.A., Wakker, A., Concepts of Polymer Thermodynamics, CRC Press, 1998. Prange, M., Hooper, H., Prausnitz, J., Thermodynamics of aqueous systems containing hydrophilic polymers or gels. AIChE J. 1989, Vol. 35, pp. 803–813. Kost, J., Pulsed and Self-Regulated Drug Delivery, CRC Press, 1990. Hoffman, A.S., Conventional and Environmentally-Sensitive Hydrogels for Medical and Industrial Uses: A Review Paper, in: DeRossi, D., Kajiwara, K., Osada, Y., Yamauchi, A. (Eds. ), Polymer Gels, Springer US, Boston 1991, pp. 289–297. Okano, T., Yoshida, R., Sakai, K., Sakurai, Y., Thermo-Responsive Polymeric Hydrogels and Their Application to Pulsatile Drug Release, in: DeRossi, D., Kajiwara, K., Osada, Y., Yamauchi, A. (Eds. ), Polymer Gels, Springer US, Boston 1991, pp. 299–308. Lowman, A.M., Peppas, N.A., Solute transport analysis in pH-responsive, complexing hydrogels of poly(methacrylic acid-g-ethylene glycol). J Biomater Sci Polym.Ed. 1999, Vol. 10, pp. 999–1009. Wu, N., Wang, L.-S., Tan, D.C.-W., Moochhala, S.M., et al., Mathematical modeling and in vitro study of controlled drug release via a highly swellable and dissoluble polymer matrix: polyethylene oxide with high molecular weights. J Control Release. 2005, Vol. 102, pp. 569–81. Li, B.Q., Free and Moving Boundary Problems, in: Discontinuous Finite Elements in Fluid Dynamics and Heat Transfer, Springer, London 2006, pp. 429–500. Higuchi, T., Rate of Release of Medicaments from Ointment Bases Containing Drugs in Suspension. J Pharm Sci. 1961, Vol. 50, pp. 874–875. Higuchi, T., Mechanism of sustained-action medication. Theoretical analysis of rate of release of solid drugs dispersed in solid matrices. J Pharm Sci. 1963, Vol. 52, pp. 1145–1149. Lin, C.-C., Metters, A.T., Hydrogels in controlled release formulations: network design and mathematical modeling. Adv. Drug Deliv Rev. 2006, Vol. 58, pp. 1379–408. Abdekhodaie, M.J., Cheng, Y.-L., Diffusional release of a dispersed solute from a spherical polymer matrix. J Memb Sci. 1996, Vol. 115, pp. 171–178. Dash, S., Murthy, P.N., Nath, L., Chowdhury, P., Kinetic modeling on drug release from controlled drug delivery systems. Acta Pol Pharm. 2010, Vol. 67, pp. 217–223. Narasimhan, B., Mathematical models describing polymer dissolution: consequences for drug delivery. Adv Drug Deliv Rev. 2001, Vol. 48, pp. 195–210. Narasimhan, B., Peppas, N.A., The physics of polymer dissolution: Modeling approaches and experimental behavior, in: Polymer Analysis Polymer Physics, Springer, Berlin 1997, pp. 157–207. Tu, Y.-O., Ouano, A.C., A multi-phase Stefan’problem describing the swelling and the dissolution of glassy polymer. Q. Appl. Math. 1977, Vol. 35, pp. 269–285. Grassi, M., Colombo, I., Fermeglia, M., Lapasin, R., et al., modeling phase transitions and sorption desorption kinetics in thermo-sensitive gels for controlled dryg delivery systems, in: Fluid Properties and Phase Equilibrium for Process Design, 1995, pp. 148–161. Huang, X., Unno, H., Akehata, T., Hirasa, O., Analysis of kinetic behavior of temperature-sensitive water-absorbing hydrogel. J Chem Eng Japan 1987, Vol. 20, pp. 123–128. Cohen, D.S., Erneux, T., Controlled Drug Release Asymptotics. SIAM J Appl Math. 1998, Vol. 58, pp. 1193–1204. Constantinides, A., Mostoufi, N., Numerical methods for chemical engineers with MATLAB applications, Upper Saddle River, New Jersey 1999. Hamming, R., Numerical Methods for Scientists and Engineers, 2nd ed., Courier Corporation, 2012. Colombo, P., Bettini, R., Peppas, N.A., Observation of swelling process and diffusion front position during swelling in hydroxypropyl methyl cellulose (HPMC) matrices containing a soluble drug. J Control Release 1999, Vol. 61, pp. 83–91. Kabra, B.G., Akhtar, M.K., Gehrke, S.H., Volume change kinetics of temperature-sensitive poly(vinyl methyl ether) gel. Polymer (Guildf). 1992, Vol. 33, pp. 990–995.